Flycatcher Lodge - Spacious Gold Award winning eco lodge. Contemporary in design and flooded with natural light to keep you in touch with nature. Ground floor king bedroom with en suite wet room. Open plan lounge/kitchen/dining area with ample seating, double sofa bed, Freeview TV, DVD/CD player and board games. Fully fitted kitchen with dishwasher and fridge freezer. First floor king bedroom with en suite bathroom (shared access from mezzanine). First floor twin bedroom with en suite wet room. Mezzanine with balcony overlooking living area. Generous outdoor decking with seating and private hot tub available. Spacious utility room with washer/dryer and cycle storage. Flycatcher features solar hot water, air source heat pump, rainwater harvesting, solar photo voltaic installations and has been built to improved quality standards. Flycatcher is not suitable for dogs - all our other lodges welcome dogs. Great property, fantastic location and all at a very good price. We stayed over just over a week, and had no issues whatsoever. The customer support was also second to none. Thanks for a great time. Thank you for the kind and generous feedback, we are happy that Flycatcher Lodge suits your needs and really appreciate you booking so regularly us you. See you soon. Brilliant venue for a wedding or family gathering! This small estate of eco homes was recommended by Hestercombe Gardens in their wedding brochure and we visited it on the same day as Hestercombe and booked six lodges almost immediately. Mill Meadow provided us with separate homes for both families plus homes for "the boys" and "the girls" and two more for various friends, giving us each a degree of independence but close proximity. There was a great deal of coming and going leading up to the wedding day, and even more after the wedding when we all stayed for New Years Eve! Flycatcher was easily large enough for all our guests to party on that night. Flycatcher was perfect for us: spotlessly clean, well equipped (though a tea cosy and oven gloves would have suited the purists! ), spacious, comfortable and especially airy with the double height living area. We loved the hot tub and made frequent use of it. Susanna and Helen were welcoming and informative, and Chris was diligent and cheerful in his care of the hot tubs. We were touched that a "Just Married" banner was attached to Robins on the wedding day for our bride and groom to see on their return. We fully expect to return with all the family. Thank you, Mill Meadow, for providing the perfect accommodation for the wedding! Other than our bed being a little creaky whenever we turned over, Flycatcher lodge was wonderful. Plenty of space, and very comfortable. Location-wise, it was very quiet and serene - however, the only place in real walking distance was a pub, in which the food choice was very limited. And there was no corner shop around for any urgent supplies. We had a wonderful time at Flycatcher at Mill Meadow. The cottage was beautiful, just as it appears in the pictures. The living space is gorgeous with all the windows letting in so much light! And the living/dining room area is so spacious! Every room was lovely, and very well equipped with everything you could ever need whilst on holiday. The owner was also incredibly welcoming to us all. Highly recommend Mill Meadow for a group holiday with couples/multiple families. An excellent place to explore the Somerset countryside. The lodge itself is lovely and comfortable. We were 5 adults including my elderly Dad and everything worked well for him. We expected the lodges to be around the lake, each overlooking it but Flycatcher is behind another row of lodges, across a lane and the lake is only accessed from one gate. This was a little disappointing especially as the lodge doesn't have a view as its patio area is surrounded by trees. There wouldn't be anywhere for children to kick a ball about as the lake area is a "quiet" area. The lodges are in a rural location with lots of local walks. We had an enjoyable few days. Excellent weekend escape in the country, relaxing, quiet time. Ideal for our bridal family weekend, plenty of space and facilities. Would definitely recommend to friends. We had booked the lodge for our son's wedding which was being held at nearby Hestercombe Gardens. The lodge was only 1.5 miles from the venue which was excellent. The lodge was extremely spacious, comfortable and very private - as a result we enjoyed spending time here relaxing rather than seeking out places to visit or places to dine. The hot tub was well-used - a lovely addition! The House Keeper was very helpful and accommodating to our requirements which was much appreciated We would definitely recommend these lodges to friends and family. We had a wonderful weekend which we will remember for many years to come! My wedding party took up 6 of the lodges over the weekend and the feedback from everyone was overwhelmingly positive. Suzanne simply can't do enough to help make your stay perfect and is always there for any last minute requests. I will most certainly be returning. I cannot recommend this place high enough. Trust me on this...the place is miles better than the pictures on the website suggest. It is perfect. Flycatcher is fabulous. As you enter the property you are immediately wowed by it, everything you could possibly need is on hand, and all the little details that make for a great stay have been thought of. The surroundings are lovely too, Mill Meadow has a lovely feeling about it. Would we return.. well we already have, and a third visit is very much on the cards. In fact it feels like a home from home already. Nine of us had a wonderful stay at Flycatchers Lodge for my sisters hen weekend. Lodge was excellent, very clean, looked exactly like it did in the brochure. We made good use of the hot tub. Everything we needed was available to us. Will definitely look at returning again some time in the future. Would highly recommend this place. Having stayed at Mill Meadow twice before this stay, I knew what to expect. The customer service received was second to none. My weekend was amazing. We were a party of 5 adults and 1 toddler and chilling out was mainly in the menu. Everyone loved the lodge, very high end. Beds comfortable and flycatcher had one side all glass, so it felt almost as if you were at one with nature. The hot tub really topped it off, we were able to end our days with a long soak. The location is such that you are 5 mins outside Taunton, so everything on hand that you need but you feel so far from civilisation. Loved it. We had an amazing stay at Mill Meadow, this was my second time visiting and I will definitely be returning for a third very soon! Very good for money, it’s got everything you need and the lodges are even more gorgeous in real life! Another Lovely Stay at Millmeadow! Me and 7 friends have returned for the 3rd time to Flycatchers lodge, and once again we had a wonderful time! The lodge is amazing, it had all we needed for a relaxing weekend. There are some lovely countryside walks near by, a nice pub that does a delicious roast dinner and we will never get bored of the hot tub! Thank you Chris and Helen for a lovely stay. Fantastic lodge, fantastic area and very modern although cosy at the same time! Definitely return!! We stayed with 2 other couple friends and we all loved it! We returned to Millmeadow for another Xmas stay. We happen to stay in the same lodge as before " Flycatcher " . Again we had a fantastic time. We had a lovely warm welcome by Helen who made sure we knew where everything was and how things worked. The lodge was warm and cosy on arrival and there was a bottle of egg nog , delicious homemade mince pies and flapjack waiting for us. Millmeadow is set in beautiful surroundings . Although we were only 12 minutes drive away from home , you felt that it was a real treat to stay away in this lovely place. A great cottage with loads of space. Hot tub was great and the kids loved the walks and lake. Staff were fantastic. Had such a great time we extended our stay by an extra night. We stayed in Flycatcher Lodge for my wedding which took place in a nearby venue. The lodge was extremely clean, comfortable and it had all the amenities we needed. We felt looked after and the team at Mill Meadow did everything possible to ensure everything ran smoothly on the wedding day. The lodge was very spacious, the hot tub was excellent and a great way to relax body and mind! Overall, we had a very enjoyable experience and we would highly recommend a stay at this lodge. We enjoyed our stay so much that we will be back for a short stay in the near future! My family and I had a wonderful time staying at Flycatcher for a week at the end of Aug 2017. The Lodge was very comfortable and well equipped. We slept very well and enjoyed cooking various dishes in the kitchen. Helen gave us a very warm welcome when we arrived. We felt like staying at home. We'll definitely come back again for our holidays! We had a fantastic weekend at Flycatcher. The lodge was very well thought out and to a very high standard in a beautiful setting. Lots of little finishing touches which really make a difference, like flapjack and Apple juice. it was an amazing place to escape the rat race. The lodge was something else, it doesn't matter what time of year you go, it will always be great. The whole family enjoyed their stay would recommend this a great experience! Lovely break at Flycatcher Lodge, Mill Meadow. Great location for us as family live locally. Any small issues we had were dealt with promptly and efficiently. Will definitely return for another relaxing holiday. My wife and I, three daughters and my parents spent an extremely enjoyable long weekend at Flycatcher. The eco lodge is quite secluded and very comfortable with spacious accomodation including three bedrooms all with en-suite facilities and a modern kitchen, oh, and the hot-tub was much appreciated at end of day. It is situated in a very convenient location from where we were able to visit various points of interest. Suzanne and her team are very welcoming and helpful and the bottle of red and birthday card they gave my Father was a particularly nice touch. Overall we enjoyed a very relaxing and comfortable weekend and will look to return some time soon. Spent 3 nights here on a sunny weekend. Flycatcher Lodge is gorgeous - spacious and very well equipped. Had 6 teens over for BBQ and the BBQ was big enough to cook enormous amounts and easy to use with great implements, charcoal and lighters all provided. The lodge was spotless....immaculate, as was the fridge, oven etc. Have stayed at a number of other locations (not Mill Meadow) with bits of food left in the freezer etc so, for me, this was impressive. No signs of previous guests and gorgeous welcoming gifts - flapjacks were gone almost immediately and milk etc very welcome. Only disappointment was the 1/2 sized dishwasher - enough to make me reconsider staying in this lodge in the future. The lodge sleeps 6 in beds - (maybe more if there is a sofa bed) and the 1/2 size dishwasher meant that I was not very eco-friendly and had to keep putting in on. Downstairs shower flooded - I understand that it had recently been fixed but I think a shower-stall would be a huge improvement - the bathroom is a good size but everything gets wet (including the loo seat!) and water ran out into the bedroom. Management were very responsive. The re-cycling is well set up and well explained. Would suggest a small amount of washing powder would be highly appreciated for short stays....Many thanks. This is our second year in the same accommodation and we are booked again for same time next year! It is perfect for our girly getaway. We took a large family party to the Flycatcher Lodge at Mill Meadow. We received a courtesy call on the day of arrival. Had a warm welcome from our hosts and this included freshly cooked flapjacks. Great location and lodgings, ideally placed for trips to various points of interest all of which were handily contained in a folder for guests. As always Mill Meadow never disappoints us (this is our third visit). Always greeted and shown the facilities (which are excellent). We stay as a groups of friends with young families and the lodges are well equipped for all your needs including bedding for the kids, great rooms and a well stocked kitchen. There is also lots of space for the children to play and us adults to relax in the evening, if we're not in the hot tub! Amazing! Recently got home following my 30th birthday, we hired Robins Lodge and Flycatcher Lodge. First of all the communication I received from Helen and Suzanne was great - no question too silly and no problem too much! And Secondly my welcome from Helen on the arrival date so so warm and welcoming! I basically made her skip with me to the lodges I was so excited, she ensured I had all her contact information and made me feel at home! Suzanne paid me a visit to congratulate me and ensure my stay was perfect. The lodges were so clean, and fully equipped with everything you need! I can't thank you guys enough for being so thoughtful and we are already trying to plan for another weekend! see you soon! We stayed for new year for 3 nights. This is my second stay at Mill Meadow and I wasn't disappointed. As soon as you arrive you are welcomed by Suzanne and her team. They were very professional, yet friendly. The lodge is to a high specification and really well equipped with everything you need. Set in a quiet location, this place is total relaxation! Hot tub is also lovely! Didn't want to leave! A lovely warm welcome by Hellen. On our arrival there was lovely homemade mince pies and flapjacks. In the fridge was milk apple juice and a bottle of bubbles ! We felt very spoilt. Flycatcher is a beautiful lodge, it has everything you could want. The kitchen is so well equipted. Suzzanne came around to introduce herself and give us a run down on how to use the hot tub. Nothing was too much trouble for Hellen or Suzzanne even though it was their christmas too. They really wanted to make sure we had a great stay. The hot tub was a hit and well used and enjoyed by the younger generation in our group. Our purpose of our stay was for two families to get together for xmas before our kids go off to New zealand on their travels. It was the perfect stay and the perfect christmas. Welcoming staff, spacious, clean and modern. Fully equiped kitchen, the best we have seen so far. Fine with a wheelchair. Will be back. We only came across Mill Meadow the day before we were planning to travel on a short break Monday to Friday. It looked like an excellent place for a relaxing break and we were not disappointed, every aspect of the break was excellent. Mill Meadow is a beautiful place set in a wooded environment in the country, yet you are only a few minutes drive from Taunton, so you get the best of both worlds. The local village, Kingston St Mary has an excellent pub serving very good food. Flycatcher Lodge was excellent, very spacious and extremely clean and well stocked, it had everything you could want. Our daughter enjoyed the hot tub to relax in! The staff were excellent from the moment we arrived, very helpful at all times. All in all one of the best UK breaks we have had, we will definitely be telling others about Mill Meadow, and will hopefully return ourselves. We stayed at Flycatcher as a family group including 4 young children. The lodge and surroundings were lovely and the children loved the hot tub. The grounds were very well cared for and safe for the children to play on their bikes and scooters. Would definitely recommend Mill Meadows and hope to return in the near future for another relaxing stay. Superb lodges. Incredibly clean and well stocked. Perfect for our wedding party to all stay together but have private time too! Lovely country setting and easy availability to walking paths. Everyone enjoyed the venue. As usual we enjoyed staying at Mill Meadow, this is our 4th visit, it has everything we need after watching the youngsters play cricket during the day. Our younger grandchild is particularly happy with the surrounding area not to mention the hot tub! !Extremely well equipped lodge, very comfortable and equally well managed by Suzanne, Chris and their team. We have booked again for next year. Millmeadow is a beautiful place. Set in a wooded haven in Kingston St. Mary you could be miles away from anywhere yet you are only a few minutes drive from the bustling Taunton. This is our 4th visit in as many years and it is difficult to see how we would ever grow tired of the location. On site management is 1st Class; the accommodation is spotless. The owners Chris & Suzanne are always on hand if you have any questions or concerns. This was our 2nd stay in Flycatchers; we love the space with the glorious vaulted two storey lounge opening onto the courtyard. Sun floods in through the full height glazing and you are whisked away to a tranquil paradise miles away. We had a wonderful family break at Mill Meadow. Flycatchers Lodge was spectacular, comfortable and spotless. The whole weekend was so peaceful in beautiful surroundings. The dads enjoyed some quiet fishing too! The short walk to the local pub was picturesque and the food was great! Suzanne was most helpful added personal touches for our young children that was much appreciated. We will certainly be returning to this hidden gem! This is out 4/5 th visit to Mill Meadow but our first time in Flycatcher. Excellent service on arrival and throughout our stay. Excellent to location for peace and quiet. Returned to Mill Meadow to stay in Flycatchers and yet again not disappointed. A stunning comfortable well equipped cabin. Suzanne Chris and the gang offer a very warm welcome and nothing is too much problem not that you need anything. I can not recommend a stay here highly enough. We loved it so much that we booked our November stay. Situated a short drive from Taunton centre and plenty of activities around but honestly the peace and quiet in mill meadow and the hot tub of course why would you want to go out. A totally relaxing Easter break. We stayed at Flycatcher for a weekend to look after our grandson while his parents were at a wedding in Taunton. Pre-stay information and organisation was excellent. We ordered food for delivery from Somerset Farmers Markets, which had arrived and was put away for us before we got there. It's an excellent service for local produce, and Suzanne at Mill Meadows couldn't have been more helpful in receiving it for us. The accommodation at Flycatcher was perfect, extremely comfortable, clean and well equipped. Baby cot, high hair and stair gate supplied. The site was pleasant and the information about local walks and facilities was great. We hadn't stayed in this part of Somerset before and we found lots to do. We had a very warm welcome from Suzanne. Another wonderful stay at Mill Meadow! We had a wonderful stay at Mill Meadow. Flycatchers is beautiful, very comfortable, clean and equipt - we especially enjoyed the hot tub! We will definitely be returning (again) and recommending to friends and family. It is very reasonably priced and well worth the money! We stayed in Flycatchers over February half term. We were on our way to Somerset when our original holiday accommodation was cancelled. Obviously with five excited children in the back this was not ideal. Luckily though we searched online and found Mill Meadow and fortunately they had one lodge available. I explained our situation and Chris was so very helpful and managed to turn the lodge around in time for us to stay. i am glad he did as it was the most comfortable and well equipped lodge that we have ever stayed in. There were even home made flapjacks which the children finished off. The decor and fittings were of a very high standard, the space was bright and open. Chris and Sue are quite rightly proud of what they have achieved here and we will definitely be recommending Mill Meadow to all our friends. Loves staying here. Comfy beds. Squishy sofa's to lounge around on and a fab hot tub. Good showers and as we were settling in to watch the rugby, a great TV. We were here for a family wedding so there wasn't much time to go out for a walk or bike ride and explore however we have planned to return for longer so we can really enjoy the location. Loved it! Stayed in flycatcher for short break in half term. Had a lovely time. Lodge was great beautiful spot and hot tub spot on!!! Back again in August!! Brilliant!!! The lodge was gorgeous, really lovely décor in all rooms and fully equipped kitchen, couple of cobwebs here and there but overall really clean. Would definitely recommend the hot tub was great in the evening. The location was quite isolated a good hour or so if you want to go off for the day. If you want total relaxation though and enjoy walks its great for that. The local pub does lush food and is worth a visit. We came as a group and its a lovely location for friends or family to get together but would also be very relaxing to go as a couple. Overall a really great stay, would recommend. Flycatchers was quite stunning. Suzanne was so helpful without being intrusive. We were a group of Lady Golfers and this was a brilliant location for a golf break as there are some lovely courses near to Flycatchers. Mill Meadow lodges are equipped with everything you need, beautifully finished and set in stunning surroundings. The owners go out of their way to ensure you have a wonderful stay and accommodate any special requests. Excellent location for our family of 4 adults and 2 young children visiting the place where our first child was born. The manager of the place was helpful and informative with good local knowledge of where to go and what to do. The hot tub although somewhat expensive was a welcoming facility after a day of walking. We also caught a 12 lb carp from the lake and what a surprise for the boys! Will certainly come back for a longer stay. MILL MEADOW is a fantastic place to stay if you are looking for a relaxing holiday! It is set in a small area of surrounding natural beauty, and has it's own fishing lake within the grounds of the site. It is a peaceful area where you can easily relax and take in the ambience of the whole area whilst you are entertained by the local birdlife, with beautiful Kingfisher's flying over the lake, and an array of other birds such as Moorhen's and Heron on the water, and House Martin's, Swallow's, and Swift's, all flying above your head, and swooping down onto the lake below! What more could we ask for as this was coupled with the luxurious interior comfort of FLYCATCHER LODGE, with it's Norwegian like Pine-wooden interior, and it's full frontal glass panes that allowed any natural light, and warmth from the sun, to flood the main Living-room area. MILL MEADOW and all of their staff went out of their way to ensure that we got the kind of holiday break that we were both looking for, and needed at the time. I would not hesitate to recommend this accommodation to anybody and everybody who is considering this location to take a holiday, as there is plenty of places to visit, and plenty to see! Finally both myself (Stuart) and my wife (Pauline) and our son's, would like to thank our host's Chris and Suzanne, and their team, for everything they did to make our stay with them as good as it was, and we hope to return with both friends and family in the future! A great lodge and experience that made our wedding weekend! We stayed in this lodge over my wedding weekend. I had my best men and a number of friends in our lodge and other friends and family on the same site in other lodges. From before we arrived Chris and Suzanne were so friendly and accommodating. Suzanne was great on the phone helping me add names to the lodge and helping me make plans for a group meal depending on what the weather was going to be like. During our stay they were again both so friendly and Suzanne even baked us some cupcakes and put up some "just married bunting"! Thank you both for a lovely stay and we will no doubt be staying with you again. Amazing cabin, very clean and comfortable with everything you need for the week. Hot tub amazin Staff very friendly. Will definitely be booking again. Return visit to mill meadow for birthday celebration and anniversary. Lodges superbly appointed and everything you could wish for is made available. Hot tub was well used throughout. Suzanne and Chris were great hosts and nothing was too much trouble for them and they made you feel at home immediately even though we did arrive late on the Thursday evening/Friday morning. We look forward to returning again in the near future. We had five lodges at Mill Meadow so that family could all stay together for a wedding at Hestercombe Gardens. The lodges were all clean & well mantained. Customer service was great. We stayed 4 nights in Flycatcher which has 3 bedrooms, all ensuite which is great if you have up to 6 people staying. The sofa bed in the lounge is not good though as there are no blinds on the huge upper windows. The kitchen is well set up and we were able to cook when needed during our stay. We loved being able to wander between lodges to visit family easily, rather than being stuck in hotel rooms. It is in a quiet location so a car is essential. Mill Meadow is an excellent place to stay - we have already started to recommend it to friends and family visiting Somerset. The standard of the fixtures, fittings and design of the lodges, the location and of course wonderful owners is outstanding and we will be back soon. Second stay at Flycatcher - as wonderful as the first! Our second stay at Flycatcher, having previously visited over Easter 2014. It was not a difficult decision to come back to Mill Meadow, our first experience was so good. The lodge itself is beautiful, light and airy and even with some unsettled weather, lovely and warm. A huge part of the success of Mill Meadow is down to the service provided by Chris and Suzanne. Nothing is too much trouble for them and little touches like homemade biscuits on arrival and Easter cakes and gifts for the kids are delightful. The lodge had everything we needed and the hot tub was an excellent optional extra. There are walks from the door, some of which are mapped and described in the Lodge handbook (complete with laminated copies to take with you - very handy!) and we found the location to be a great base for exploring Somerset. In summary, we would very much recommend Mill Meadow to anyone and will be returning again in the future. We stayed in the Flycatcher lodge. With its impressive wall of windows, high quality fixtures and fittings, spacious rooms and everything you need (and more) for a self catering break - we were more than impressed. Suzanne greeted us despite us arriving late. Suzanne is very friendly and quite rightly very proud of Mill Meadows. We admired the Eco emphasis with our part being to sort our recycling into bins provided in our lodges utility room - more than happy to do that. We could have paid for the use of the lodges large hot tub which looked fab - definitely next time. Mill Meadows is ideal for short breaks for a group of friends or family - highly reccommend. The Flycatcher's Lodge was all that we hoped for and more! The bonus for us since we were from three different locations (Kelowna BC, Canada; Penticton BC Canada; and Salisbury Wiltshire was that we all had our own ensuite bathrooms. The communal area was great for sitting and chatting and also for meal times. When we had one night with an extra guest and young daughter from Yorkshire that too worked well as we had the sofa bed and it meant they could use the room with the twin beds. The Lodge was lovely and clean and a pleasure to be in. We would certainly consider using this again. What can I say but we had a wonderful stay here. Everything we needed and more was there. A lot of thought and attention to detail has gone into equipping the lodge. The homemade biscuits, Apple juice, milk in the fridge, a vase of fresh roses amongst some of the things. Suzanne showed us how things worked and told us not to hesitate to get in touch if we needed to. The bed linen and towels were lovely and fresh and everywhere was spotlessly clean. It was so peaceful, loved watching the antics of the squirrels at the feeders outside the lodge. The hot tub was ready for us when we got there and we made full use of it! Lovely sitting in the moonlight although our towels had started to freeze when we got out! The tub was checked regularly during our stay. Close enough to town to get anything you needed. We will return as we loved it all. There were 5 adults and 2 children in our party and there was plenty of room for us all. We stayed in flycatchers, the facilities were great, could not fault anything. All seven of had a lovely time, would recommend this to anyone. We all had a great time and the accomodation was great. This property is simply stunning... It comes fully equipped with every facility you could wish for from a luxury rental home, apartment or short stay accommodation. The views and location can be beautiful when you venture out into the nearby village and up towards the Quantocks. However, if you do intend to leave the hot tub and explore the surrounding environment be sure to get a car as It is around a 10 minute trip into Taunton town centre. Flycatchers provided the best self catering accommodation that we have ever had the pleasure to stay in!! Comfort, warmth and beautifully appointed and furnished. Excellent property excellent service bySusanne would definitely recommend and would hope to visit again.very peaceful surroundings in a beautiful location"
Very pleased with everything to do with our accommodation and service we received during our stay. Lovely Lodge, nice secluded setting peaceful and quiet, and very helpful hosts. We came we saw we conkered. Flycatchers is a really well laid out, generously proportioned, light filled, warm and airy, lodge. For large family gatherings or more intimate groups it is the perfect base from which to explore the nearby countryside. There are a few gripes however. The cooking eqipment (knives and pots/pans) seem cheap and a bit tinny. Better quality items would make for a more enjoyable experience in the kitchen. It is annoying that for all the lodge's 'green' credentials, most plastics cannot be recycled - maybe incorporating a large recycling skip on site would fix this so the waste could be both stored onsite in a larger amount and all be collected...this would then also be arguable more environmentally friendly as the collection would require less visits by petrol/doesel powered vehicles.There is just one roll of toilet paper in each bathroom. As the cost of the lodges is quiote high, providing more of cheap items such as this would be appreciated.To remove some of the heat from the upstairs rooms, windows have to be open. This is an okay system except when neighbouring lodges are enjoying loud conmversations/music into the night. Could some form of heat extraction/ventialation be looked at? Maybe lodge kitchens could be stocked with a few standard items such as cooking oil, better salt/pepper mills, a selection of herbs/spices, ... - though it is expected that guests have to bring their own food, life would be far easier and so stays far more enjoyable (and so repeat visits far more likely) if the hastle of having to provide these items were removed. 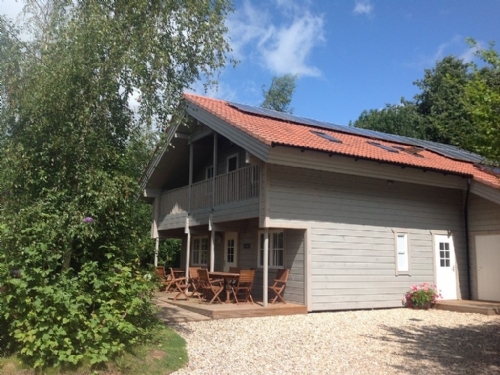 for a family to share, a brilliant lodge with 3bathrooms in a lovely part of Somerset. the short walk to the White Swan in the village for Sunday lunch is a must! A truly wonderful lodge in a wonderful location run in a very caring manner by the owners. We have been using lodges for holidays for more years than we care to mention and each year we seem to surpass any lodges we have used previously, I don't know how were are going to outdo the Flycatchers Lodge at Mill Meadow. The photos on the website don't do it justice, everything was perfect, very spacious, spotlessly clean, extremely well furnished and equipped with top of the range appliances and fittings. The utility room with the washer was perfect for drying the towels after the hot tub. The external area was ideal for eating out with the barbecue they supplied and sitting in the hot tub after dark with the lodge lights out watching the stars was something really special. The setting of the lodge was excellent, we felt we were in our own little forest yet access to the motorway was only ten minutes away. The peace and tranquillity was only broken by the sound of the local wood pigeons and church bells in the distance. Suzanne and family were very welcoming and attentive with home made biscuits and a local bottle of apple juice on arrival. Truly a wonderful lodge. it is in a very nice setting not far from the main road but still peaceful. The lodge is very spacious and clean. We paid extra for the 6 man hot tube which was filled fresh the day we arrived and was excellent. If the hot hot tub was all in the price I would of said excellent for value. My wife and I stayed here for a week at Easter along with our three teenage children. Granted we were very lucky with the weather, but even so the complete package was outstanding. The property is quite exceptional, all open plan downstairs with a mezzanine and two en suite bedroom pods upstairs. The children were happy with the on tap wi-fi but they were also keen to visit the surrounding areas; Weston Super Mare, Taunton town centre and even Glastonbury (met with a mixed response). We hired the hot tub which was a nice way to relax in the evening and overall had a fantastic time. We would recommend Flycatchers to anyone, be they couples or larger families. It is truly worth the money.